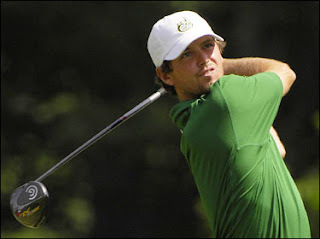 Former Charlotte 49ers golfer Trevor Murphy has qualified to compete at the 2009 U.S. Open Championship June 18-21 at Bethpage Black Course in Farmingdale, N.Y.
Murphy was one of four players to advance out of sectional qualifying in Purchase, N.Y., on Monday. Murphy shot a 70-68-138 to tie for second at the site. Murphy lettered four years with the 49ers from 2005-2009 and was part of an historic class that participated in four straight NCAA Tournaments. In his last two years, Murphy was part of a Charlotte team that finished tied for third (2007) and tied for eighth (2008) in the NCAA Tournament. The 49ers also won three Atlantic 10 championships during his tenure. In addition, Murphy qualified for the 2008 PGA Wachovia Championship at Quail Hollow Country Club in Charlotte in his senior year. Murphy, competing as an amateur, shot +3 at the event to narrowly miss the cut by two strokes. Murphy turned pro following his senior season. Charlotte rising senior Corey Nagy advanced to US Open sectional qualifying but failed to advance out of the sectional at Ball Ground, Ga.